In China, the leopard's fierce and ferocious power yields only to that of the tiger. Though the leopard is a smaller animal, it is believed to be, pound for pound, stronger. The leopard relies on a lightning-fast, powerful force that is produced from relaxed, whip-like techniques. It is important for the practitioner to develop a flexible waist, which allows him to develop quick footwork and explosive strikes. 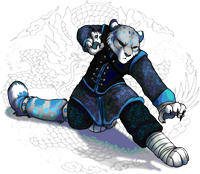 Since the leopard form focuses on quick movements, there is little internal energy training. But the internal strengths of the dragon and snake blended with the speed and force of the leopard make a devastating combination. The main technique used in the leopard form is a leopard fist that penetrates vital areas of the opponent's body, such as the throat, solar plexus and groin. There are also elbow and forearm techniques. The leopard's footwork is quick and short, which helps the practitioner develop strong stable stances.